If you followed my odyssey on Facebook, you know that the first time I tried to go to Nippori Textile Street, I got super, super lost, and wandered around a residential area in Tokyo for an hour and a half before getting there with less than an hour to closing time left. Then the second time I went there, there was a heat spike at the exact time I visited, with 90+ degrees and percent humidity and I got heat stroke (gimme a break, I was shoveling snow less than a month before). But I'm persistent! I went back a third time after I bought a parasol, and timed my visit so that I'd be there at the coolest time of day that they'd be open. Nippori in Tokyo has a little under a hundred fabric stores on one street. It's a bit like fabric shopping in the Fashion District in Manhattan, in that all the stores are right next to each other, but I liked it quite a bit better: in Manhattan, the stores all cater to high end fashion, so there's not much doll-friendly or even casual clothing friendly. In Nippori, every store had a specialty. There were stores that just specialized in handbag material/accessories, stores that just dealt in leather, stores that just dealt in kimono fabric, stores that just dealt in fashion knits, etc etc etc. I wandered into about 1/3 of them for potential dolly sewing purposes. 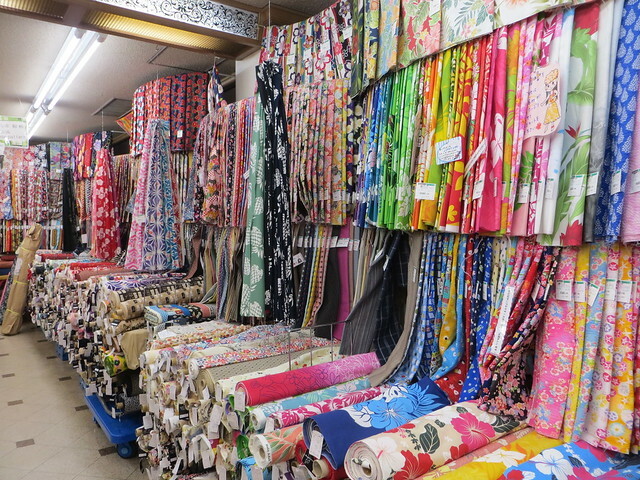 Kyoto doesn't have everything handily in one place for fabric shopping, but if I went back to Japan and could only go to one place, I think I'd prefer Kyoto, even though I really only hit up 2 fabric stores there: Nomura Tailor and Nomura Tailor House. Tokyo shops had a 1-meter/bolt minimum cut purchase, Nomura had a 30cm minimum purchase. Nomura also had a lot more small-piece remnants, whereas in Tokyo, most remnants were > 1 meter. For doll sewing, it was just a better fit. That is ONE AISLE of ONE FLOOR. So yeah, one shop stacked up pretty darn good against an entire street of fabric shops in Tokyo. For doll stuff anyway. If you go, both places had the same rule where you buy fabric separately on each floor and then do a tax discount after you finish your purchases with all of your receipts at the same time. In Tokyo you'd bring the fabric up to the cutting table yourself, at Nomura you'd point to the fabrics you wanted and a stock guy would find them all and bring them to the cutting table for you. One last thing before I get to my haul pics--QUALITY. The Japanese fabrics were all excellent quality. I sent my husband to scout out what was on the upper floors for me while I stood in line on the first floor and he came back gushing about how nice the fabric was. This is the guy who tolerantly follows me around US fabric stores while surfing on his phone. So... yeah. It was really nice. Quilting fabrics, which tend to be low end stuff you wouldn't make clothes out of in the US, were all as nice as any cotton apparel I've ever owned and generally no more than $7/yard. Apparel fabrics were incredibly soft and finely woven and generally no more than $20/yard unless you got into stuff like laces. If I had access to this kind of quality and variety at home, I'd make all my clothes. I was pretty sad that my dolls would be getting all the good stuff. Textured fabric. If you go into a Furoshiki (ornamental wrapping cloth) store, this is the kind of fabric you'll see. The prints are amazing, but the texture makes the fabric a bit stiff, so I didn't get a lot as I don't know how well it will work for doll stuff. If you see a furoshiki with a print you like, might want to check a fabric store since you can find most of the prints on bolts for more fabric way cheaper. And the laaaaace. Beautiful trim, & stretchy lace to do doll underwear. Super expensive but still about 1/3 to 1/2 the cost of similar stuff in the US, so I stocked up! 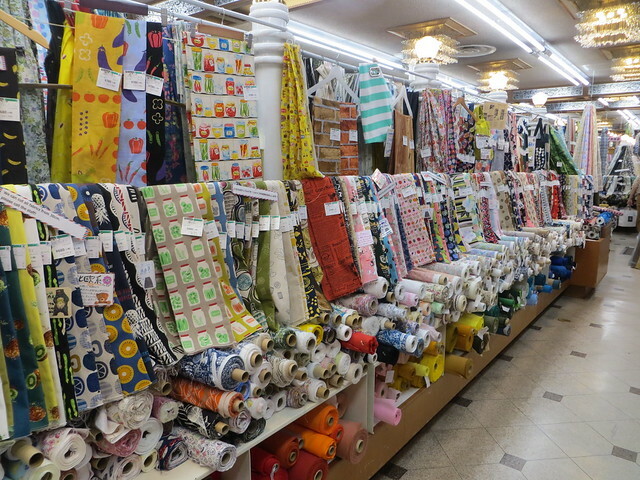 So if you are going to Japan and are remotely interested in sewing, please do yourself a favor and check out the fabric shops there. They are incredible, and I will miss being able to go to them more than being able to go to the doll shops.